We have all heard that working in the commercial fishing industry is the most dangerous type of work in the nation. Commercial fishing has long topped the Bureau of Labor Statistics’ list of jobs with the most injuries and fatalities. However, many accidents happen before boats leave the dock or upon returning from sea. This is because many vessels are not seaworthy, and seaworthiness begins with safe access to ladders, walkways, gangways, and gangplanks. Gangway related injuries and fatalities are so common that The Shipowners’ Protection Limited, a mutual insurance organization, has published a report titled Gangways, which can be read in full here. Under Maritime Law, a vessel is considered unseaworthy when a vessel is poorly kept or poorly maintained. In some cases, ship owners may fail to supply proper means for the crew to pass from ship to shore. A seaworthy vessel must have well-maintained equipment that is in working order. Workers must be properly prepared and trained, and routes for boarding, disembarking, and loading a vessel must be hazard-free. Jumping on or from the vessel is not an option. Even if the vessel is less than a foot from the dock, the ship owner is required to provide a safe passage for workers to and from the dock. When evaluating a case, a lawyer will consider the nature of an injury as well as the seaworthiness of the vessel. Maritime work is dangerous by its very nature. However, that does not mean that workers must accept a high level of risk. There are many federal and industry safety standards that apply to boarding and disembarking a vessel, including Coast Guard regulations and OSHA regulations. If these safety standards are ignored, there can be liability on the part of the vessel owner. For example, using a gangway to board a vessel does carry some amount of risk. But that risk is mitigated when safety precautions and guidelines are followed. If, however, safety is ignored, then the act of using the gangway carries unacceptable risk. This is considered negligence and unseaworthiness. 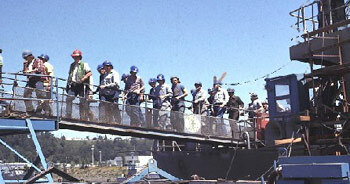 Workers MUST have a safe and well-maintained way of getting aboard and disembarking a vessel. Most accidents are avoidable by proper maintenance and by following proper procedures. Maritime law is in place to ensure that injured workers have a way to recover damages from the responsible parties when injuries are due to negligence, neglect, improper procedures, faulty equipment, or unseaworthiness. It is imperative that you retain legal representation if you feel any of your rights have been ignored or violated. • Report the incident to your supervisor. Properly document what happened right after the incident, and take photos if you are able. Talk with anyone who witnessed the incident. • Seek medical attention immediately to address your injuries. You have a right to select your own medical doctor and receive a proper medical evaluation. We strong urge you to get medical attention right away. If you delay, the insurance company may argue that you were not hurt on the job. • Follow all orders and recommendations prescribed by your doctor. Do not miss any follow-up appointments, and seek the help of specialists when recommended. Under the Jones Act, injured maritime workers can recover lost wages, loss of earning capacity, lost benefits, lost accumulated time off, damages for pain, disfigurement, disability, and loss of enjoyment of life. If these injuries were incurred while boarding or disembarking a vessel, they are covered by Jones Act law and general maritime law. Most accidents are avoidable by proper maintenance and by following proper procedures. If you feel your rights have been ignored or violated, it is imperative that you retain legal representation. See What to Do If You Are Injured at Sea – The First 6 Steps for a detailed list of what to do if you are injured in any way while working in the maritime trades.